Dubai: Montblanc’s Titanium Summit has been awarded Best Digital Watch at the prestigious Middle East Watch of the Year Awards. The Summit timepiece marks the luxury Maison’s debut entry into the smartwatch world, providing the perfect alchemy between the design codes of traditional fine timekeeping, premium materials and state-of-the-art technology. Made of titanium grade 5, and with a satin and polished finish, the timepiece’s display is covered by a slightly curved scratch-proof sapphire glass – a world first in smartwatches – in order to give the feeling of wearing a real watch on the wrist. Powered by Google’s Android Wear 2.0 ensuring compatibility with iPhones & Android smartphones, the Summit allows users to check notifications and agenda at a glance and reply by text or voice. Additional functions include voice translation, navigation and worldtimer for the smart traveller, as well as an integrated heart rate monitor, altimeter and fitness tracking sensors for fitness enthusiasts. The smartwatch also allows users to play and control music from their wrist, and enjoy several pre-loaded apps including Runtastic, Uber and Foursquare, with the option to download more directly from the watch via WiFi. 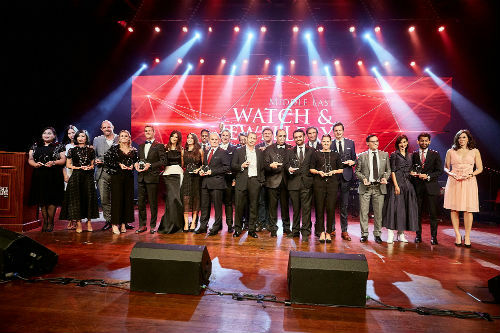 Now in its 13th year, the Middle East Watch of the Year Awards were established to recognise watchmaking excellence. The winners of this years’ edition were announced during a private gala evening held in Dubai on Wednesday 15th November 2017.